Microsoft is rolling out three new pricing options for its cloud-based Office 365 services aimed at small and mid-sized companies with up to 250 employees. The new plans are available today, and range from $5 to $12.50 per user per month with an annual contract. The cheapest package Microsoft will offer is called Office 365 Business Essentials, and as you might expect it offers a pretty bare bones experience for just $5 per user per month. It includes core services for email, calendar, Office Online, IM, video conferencing, cloud storage and file sharing, but no desktop apps. 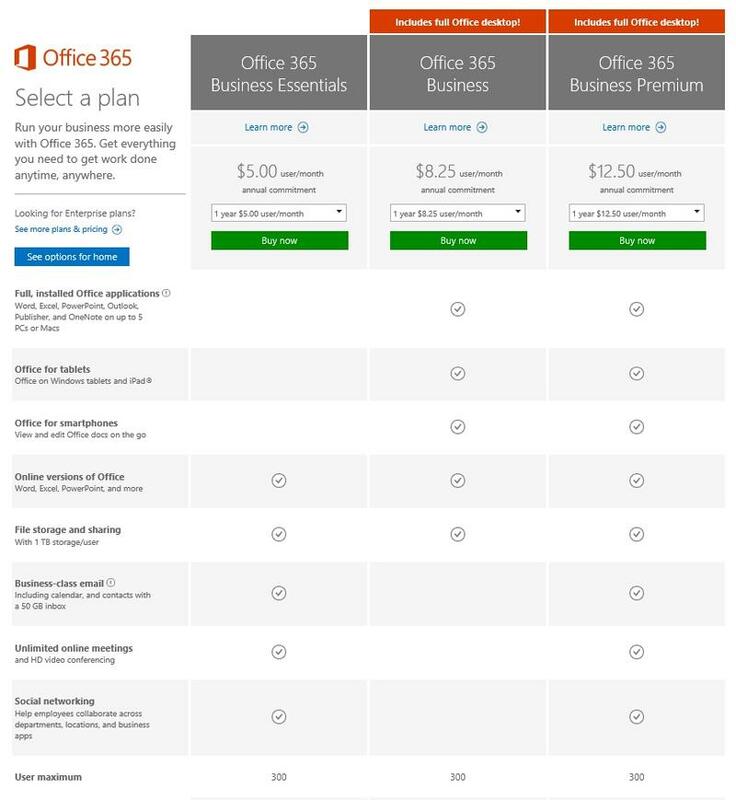 For a little more $8.25 per user per month, businesses can grab the full version of Office 365 Business, which includes access to official Office apps including Outlook, Word, Excel, PowerPoint, OneNote and Publisher along with online access to some services. Finally, there’s Office 365 Business Premium, which gets you everything from both plans combined for $12.50 per user per month. Microsoft will still offer its legacy Office 365 Enterprise plan, too. Microsoft is hoping to make the transition to these new plans as smooth as possible. Any business that signs up for Office 365 will automatically have access to them, while current enterprise customers need to wait until their existing subscriptions are up. If you’re still confused here’s a chart from Microsoft breaking down what each option has to offer.